46. Blackadder, Richard Curtis et al. 56. The Book of God, Walter Wangerin, Jr.
70. A Canticle for Leibowitz, Walter M. Miller, Jr.
185. The Growth of the Graphic Novel Format in the U.S.
212. I'm OK - You're OK, Thomas Harris, M.D. 240. The Killing Joke, Alan Moore et al. 286. Molly Ivins Can't Say That, Can She? 345. Promethea, Vol. 1, Alan Moore et al. 375. Sandman: Fables and Recollections, Neil Gaiman et al. 458. Warm Worlds and Otherwise, James Tiptree, Jr. Overtime, Tom Holt, Orbit, 1993, ISBN 9781857230390, 256pp. 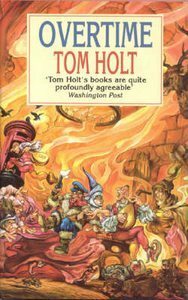 While not as humourous as some of his previous books, Tom Holt still delivers the fun. (Judicious editing will make that as good a blurb as any of Rex Reed’s.) I think I missed out on a lot that was going on here because I can’t read French and thus was unable to translate the many chansons included here. This was also Holt’s first book to really utilize time travel; he had used the concept of long periods of time between characters in Who’s Afraid of Beowulf and Flying Dutch, but this is the first time modern characters have moved backwards in time for him. The trick with humourous fantasy is that the fantasy must stick to certain rules for the humour to come across as funny rather than just another piece of fantastic. Unfortunately, by the wild nature of time travel, Holt got very close to stepping over the line here. In fact, my favorite Holt novels are the “Walled Orchard” duo, in which he meticulously draws realistic Ancient Greek culture (with some ambiguous insertions of the fantastic; by the way, he is an ancient history scholar) and then adds the humour (although it had a tendancy to be slightly black because of the realism). There’s some great bits here: the definition of Time & Overtime, and how they differ; the Anti-Pope; the Beaumont Street investment firm (the Crusades always provided the highest yield); a wonderfully done deus ex macchina; and how the world was made. But this seemed to be made of more bits than whole. Maybe that’s the nature of time. First Impressions by Glen Engel-Cox is licensed under a Creative Commons Attribution-NonCommercial-NoDerivatives 4.0 International License, except where otherwise noted.